The fifth annual Beer and Bivalves Oyster Festival took place on October 8th, a mild but rainy Sunday. 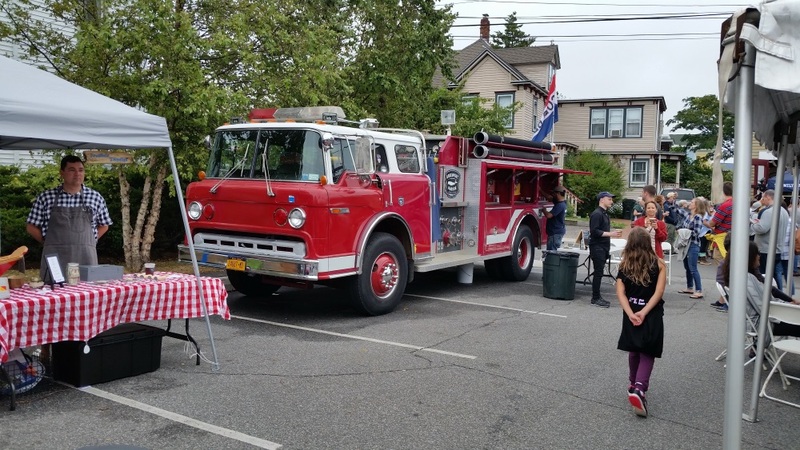 A friendly crowd circulated among the half-dozen oyster farm stands, the well-loved Beer Truck née Fire Truck, a Noah’s stand, and the ever-popular porta-sans. We do love oysters, and this year we polished off 3 dozen, and a couple of Oyster Stouts. You know the drill… dress the half-shelled gems with hot sauce or mignonette, and slurp it down. Delish, indeed. Which were our favorites? Hard to say. We’ll have to take better notes next year. Meanwhile, here are some pictures of the oyster stands, participants, and of course, some friendly companion animals. Are you in this crowd? This was an excellent afternoon. I urge you to take advantage of a singular oyster experience in Greenport, NY when Columbus Day comes around next year.